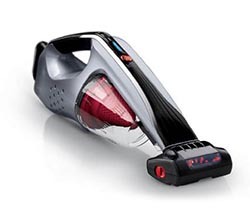 The Hoover BH50030 Platinum LiNX Pet Cordless Hand Vacuum makes a lot of claims for such a small vacuum. Can all the performance and features Hoover advertises really be packed into one handheld? Find out below. The LiNX handheld has astonishing power for such a small vacuum – at 18 volts, it’s comparable to power tools like cordless drills, and even a strong cordless stick vacuum. Hoover actually has designed a uniquely versatile handheld vacuum. Most handhelds can only handle crumbs at best, but the LiNX has enough power and runtime to even do sections of carpet if you were so inclined. On top of that, there are design components that can clean messes ranging from ground-in dirt in carpet or fabric to extra-clingy pet hair on your couch. There’s no need to torque your wrist with a nozzle that pivots twenty five degrees – it may not sound like a lot, but it really makes a difference. The LiNX’s motorized brushroll, which is unusual for a handheld, makes dealing with messes that land on carpet much easier. The brushroll also easily pops out for maintenance – that’s especially handy when you’re cleaning pet hair. The LiNX’s power flows from a high-end Lithium-Ion battery that won’t fade at all throughout its outstanding ten minute runtime. Ten minutes might not sound like a lot, but remember that handhelds are used in short bursts to clean smaller messes. Ten minutes is more than enough time for several of those cleaning sessions, and an LED battery gauge will let you know when it’s time to charge. The LiNX’s charger is also special in requiring the battery to be removed. This may seem like an extra step, but what it really means is that the charger takes up much less space. At 6.2 pounds, this vacuum is a little heavy for a handheld, but not so hefty that it will wear you out. The LiNX uses simple foam filters. These have the advantage of being able to be easily washed with water, and are also quite affordable if you’d like to have extras or replace them. This vacuum’s container is fairly small, which is common with many handhelds. On the plus side, it is transparent so you can keep an eye on when it needs to be emptied. It’s also easy to clean. Hoover includes a dusting brush with two rows of soft bristles for more delicate surfaces such as cabinets or your car console, but they really shine in terms of accessories with a unique pet hair upholstery tool. This tool has a special three-blade design, with each blade made of a rubber especially created to adhere to and pick up pet hair. The LiNX comes with a longer warranty (see below), and that really speaks to its reliability. It’s a sturdy handheld, and Hoover’s well-known quality will carry it through years of use. This is not a cheaply made vacuum. Along with their reputation for quality, Hoover also has a reputation for excellent customer service, and it shows with a limited two year warranty for the vacuum itself and also a limited two year warranty for the battery as well. That’s a fantastic warranty combination for any kind of vacuum. The price for the LiNX might seem expensive for a tool as small as a handheld, but it helps to put things in perspective. This vacuum is the cream of the crop for handhelds, and if you want the top of the line, you’ll recognize that spending a little more is worth that quality. The LiNX offers an unparalleled mix of performance and features in a handheld vacuums. A little extra expense is by far worth it for such a powerful cleaning tool. Whether you have dirt or crumbs to deal with or pet hair all over your couches, this is one of your best choices for a handheld vacuum.